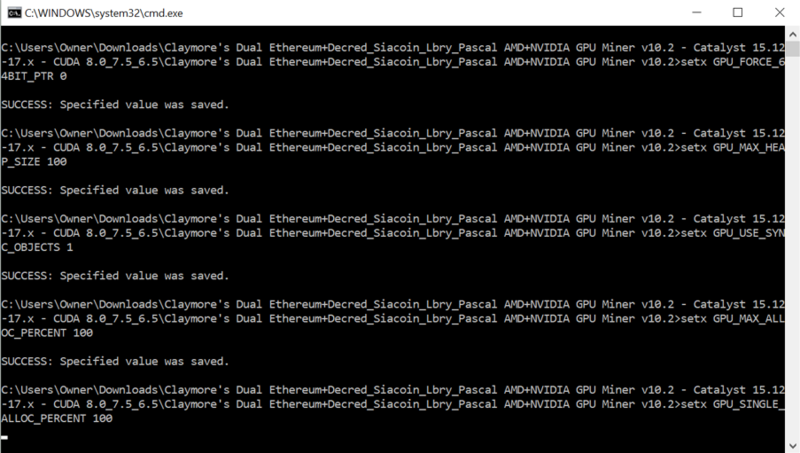 Hi, am new to this myself but somehow managed to get my Claymore miner up and running without any issues. Would you mind sharing your .bat file so we can see if all is correct there? A bit more info on what you are trying to mine and from which pool would also be helpful. There are a few things I can think of here. Your card's VRAM + your system's RAM might not be able to handle the Ethereum DAG. It's huge right now, and still growing, though I may be wrong about the "still growing" part. The other thing is that you might just be crashing your GPU I would try adjusting the following to troubleshoot: Adjust your OS virtual memory settings. Adjust the clock and voltage settings on your GPU. Try adjusting the OC and allocation settings. Start low, and go slow until you find a stable configuration. Try upping the virtual memory first, though, so you don't have to do anything with the GPU that might impede hashing power. That seems to do the trick for most people. Also, I've taken to launching my miners out of Awesome Miner, because it automatically brings them back up if/when they crash. IT's pretty intuitive and does its job, even on the slimmed-down free version. I think the point here is "Laptop". Are you running a powerful gaming laptop with a proper gpu inside or is it just a work laptop with integrated graphics? Instead of double clicking the .bat, open up cmd and run it from the directory. It will still stop but won't close the window so you can see what the error is.